Judikins Embossing Powder 2oz - JUDIKINS-Embossing Powder because sometimes, your creation needs that extra special something! What a beautiful way to add color, dimension and sparkle to anything you make with stamping. 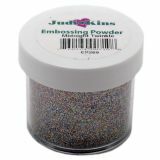 Clear thick embossing powder with clear glitter that hints of color. Sparkle color changes with added heat. It covers using clear embossing ink with embossing powder and using pigment inks beneath the clear embossing powder, should be layered on dark color paper or contrasting colored pigment ink for best effect. This package contains one 2 ounce/59g jar. (Embossing ink and pigment inks sold separately). Made in USA.